The other day I picked the largest zucchini I have ever seen. Unnoticed beneath a tangle of vines, this zucchini grew to mammoth proportions. Now, not every zucchini can hold up to stuffing, but this one was made for it. I chose lamb for the filling – a hearty meat with a distinct flavor perfect for this dish. If you’re not a fan of zucchini, squash or eggplant would work well here too. 2. While oven is heating, slice zucchini lengthwise. Spoon out and discard seeds. 3. 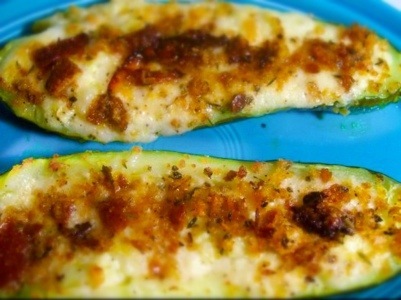 When oven is ready, drizzle zucchini with olive oil and sprinkle with salt and pepper. Place cut side down on baking sheet and place in oven. 4. Let the zucchini roast for 15 minutes or so, until it is soft, but still holds it shape well. Remove from oven when edges are brown. 5. While the zucchini is roasting, heat two large pans over medium heat. Drizzle both with olive oil. 6. When oil is shimmering, add one clove of garlic to each pan. Add onions to one and tomatoes to the other. 7. Sprinkle the tomatoes with salt and lower heat. Let cook til almost disintegrated. When tomatoes are melted, stir in basil and remove from heat. 8. While the tomatoes are cooking, let the onions cook til translucent. 9. When onions are ready, stir in lamb, cooking until browned. Season with S & P and remove from heat. 10. When all ingredients are prepped, ladle tomatoes into bottom of zucchini boats, then layer lamb and onion mixture on top of tomatoes, before spreading the cheese evenly on top. 11. Pop boats back in oven until cheese is melted, about 5 minutes.